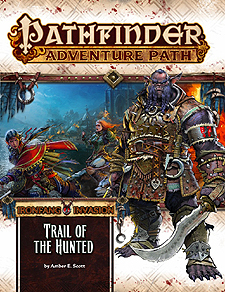 The Ironfang Invasion Adventure Path launches with "Trail of the Hunted," a tale of desperate survival set against the invasion of a ruthless hobgoblin army - the Ironfang Legion! As the Ironfang Legion begins carving out an empire of monsters, the heroes must flee their hometown of Phaendar as it burns, saving any lives they can. The heroes guard their band of survivors in the wilderness, challenge a troglodyte tribe for safe haven, and face the brutal bounty hunters dispatched to end their flight to freedom! "Trail of the Hunted," a Pathfinder adventure for 1st-level characters, by Amber E Scott. A detailed overview of the Ironfang Legion, including its history, membership, and tools, by Ron Lundeen. A gazetteer on the expansive Nesmian Plains, a rugged wilderness of breathtaking vistas and tangled histories, by Crystal Frasier. A bestiary containing new regional threats and allies, by Crystal Frasier, Amber E Scott, Tonya Woldridge, and Linda Zayas-Palmer.